No Quarto da Vanda/In Vanda’s Room is Pedro Costa’s fourth feature, and stands as a decisive break in the director’s work, the start of a new approach to film and to the people – his main if not exclusive subject matter – he has remained faithful to ever since (including several short, “footnote” pieces he has completed after Juventude em Marcha/Colossal Youth ). Most likely, not even Costa himself has much idea of how long this affiliation will last or what results it will yield. This is what is truly experimental in most (if not all) of Costa’s films: he never sets out to put into pictures a script, and he doesn’t already know what he will find during the shooting process, what people will tell him, show or avow to him, nor where the stories they tell will lead the film. It probably takes some months for him to determine whether there is actually a film in the making, to discover its shape and structure. And then he has to try and capture what that is, selecting from many hours of tape what is really true, or meaningful, or moving, or intriguing, or mysterious. That’s why he has become his own producer and is making films by himself or with a very small crew and as little money as possible, being only generous with his time, in fair exchange for the time his character-actors, his eventual friends, will give him. This gift and the mutual trust between them and Costa are the springboards for this increasingly impressive series of movies in which all theoretical or academic distinctions between fact and fiction, documentary and narrative, soon loose any meaning, become senseless: what matters is the truth, even if that is merely the faithful rendering of people’s illusions, dreams, fears, nightmares, tale-spinning impulses or the oral tradition they embody in the transmission of legends or family myths. Although on the threshold of a new cinematic territory, this rupture is not total: already in Ossos/Bones you could see Vanda Duarte in a secondary but essential part, as well as later in Juventude em Marcha. She significantly features as the absolute non-starring protagonist of No Quarto da Vanda (but… is it a role she plays? It isn’t, in any case, a role written for her, or that she had to play on Costa’s orders). When speaking of a radical change taking place inside No Quarto da Vanda, I don’t mean to point out Costa’s first use of digital video, a form he has used ever since. I’m not hinting either at the film’s supposedly documentary character, which is never proclaimed or announced, being neither obvious nor underlined, much less used as an alibi to make you believe what you see. Costa’s later films are only slightly, and microscopically, fiction, since they record individuals who sometimes play, act, invent themselves as characters or get fascinated with their own words. What these films have become are great instances of a genre with a long tradition in painting and writing that is seldom explored in the cinema – the portrait. These films are, at heart, portraits of real, living persons. Many such portraits by painters were, more often than not, directly or not, assignments, while Costa chooses his models, negotiates with them in relation to how and when he will visit them. In order to work together with them for months or years, they must, understandably, seem interesting enough to Costa, and he must win their trust and keep it. He must also be flexible enough to not only film them, but to talk to them, to simply see them and listen to them, while remaining unobtrusive, so they can forget the camera, little and silent as it may be. This combination of intimacy and distance – or, rather, respect and concern, for Costa’s films are never cold – of practical solidarity with the characters and loyalty to their real environment and living conditions (which are a logical but unusual result of growing mutual knowledge and shared experience over long stretches of time, even years), have certain implicit moral responsibilities, a knowledge of which is essential to a proper understanding of Costa’s films. In Où gît votre sourire enfouie?/Where Does Your Hidden Smile Lie? (2001) the main characters are two well-known filmmakers – although absolutely on the margins of industrial cinema – a real couple of very cultivated and intransigent creators, Jean-Marie Straub and Danièle Huillet (who stayed together and continued working until 2006). 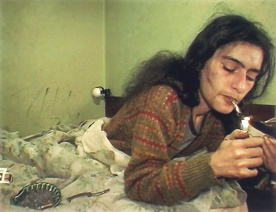 In all of Costa’s remaining portrait films – surprisingly not as different as one might think – the protagonists are various inhabitants of the Lisbon slum of Fontainhas which, in the course of the protracted shooting process, has been more or less fully dismantled, if not wholly abandoned by its dwellers who seem to dislike their new lodgings and feel lonely and ill-at-ease between their cold whitewashed walls. These neighbours, mostly long-ago arrived immigrants from the former Portuguese African colony of Cape Verde, or their Lisbon-born children, are not a uniform group. Each has his or her own personality, life experience, troubles or longings. But most, by the time of Juventude em Marcha and of the Terrafal episode included in O Estado do Mundo (2007) – I have not seen the A Caça ao Coelho com Pau episode included in Memories (2007) – seem to sorely miss the community they enjoyed in Fontainhas, as shown mainly in No Quarto da Vanda. On principle, since they are not properly fiction – although fantasy, oral storytelling, Africa legends and myths, treasured memories and dreams are highly relevant – the later Costa films cannot be labelled as narratives, or only insofar as every fragment, tiny as it may be, of one or several intertwined life stories, becomes narrative simply because events happen chronologically and film shows them, whatever the order chosen, in succession. It is a question of building a structure. Even if shot digitally without chemical film, without real reels, all cinema is, at least metaphorically, a running tape. It is therefore a series of moments, even if nothing happens but the passing of time itself, which never stops. Miguel Marías has been a film critic since 1966, a former director of the Spanish Film Archive and the author of books on Manuel Mur Oti and Leo McCarey.